Lake Trout are well known for growing very large. 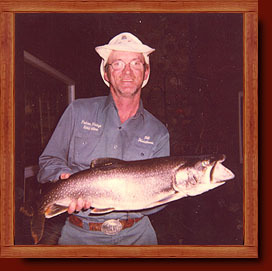 The Ontario Record Lake Trout is 63 pounds and was a world record for over 30 years. Lake Trout are not trout at all. 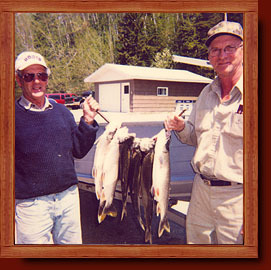 Lake Trout are a member of the Char family. The most obvious physical trait that separates them from the trout family is the forked tail. We do not have Lake Trout in Ivanhoe Lake because the water gets too warm for the trout in the middle of summer. However, we have 3 really nice Lake Trout lakes that are easy to access and not far from the lodge. The average size Lake Trout is around 3 pounds, which is the best eating size, but some of our guests run into bigger trout in the 5 to 10-pound range. Our three Lake Trout lakes have the potential to produce 20 and 30 pounders.